Demand for qualified ethical hackers is expected to rise to six million by 2019. Study our world-renowned Ethical Hacking degree and discover a fascinating field with great career prospects. Why study Abertay's BSc (Hons) in Ethical Hacking? Cybercrime is a growing threat. Consequently, the world is seeing a rapid increase in the demand for ethical hackers – experts who break into computer systems and networks in order to find and fix security weaknesses. 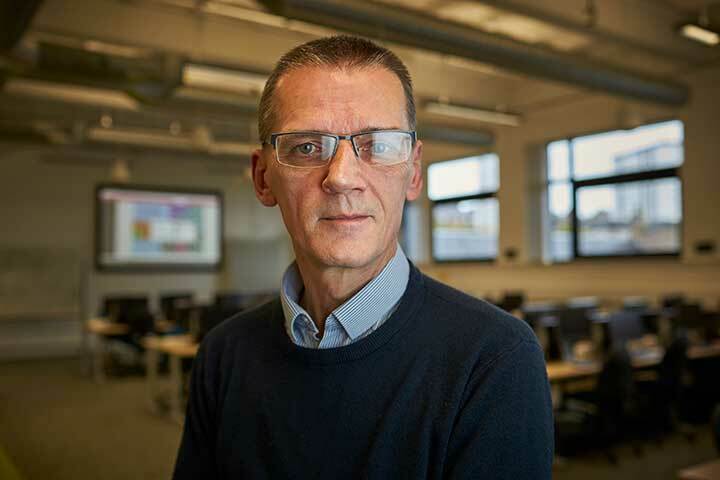 Since launching the world’s first Ethical Hacking degree in 2006, Abertay University has been at the forefront of new developments in cybersecurity, producing highly-skilled and in-demand graduates. The first Ethical Hacking degree in the world. Recognised as one of the UK’s leading cybersecurity programmes. The programme takes an offensive approach to security, which means you will learn how to break systems and circumvent security defences – not just study encryption. Accredited by BCS – The Chartered Institute for IT. Great industry links and recruitment opportunities. What makes Abertay’s BSc (Hons) in Ethical Hacking unique? Abertay students and staff talk about why they love the course and what makes it different from other cybersecurity degrees. Please note: All applicants must have a pass in Maths - National 5 grade C or GCSE grade C/4 or equivalent. National 5 Lifeskills Maths not accepted in lieu of Maths. Higher ABBB One of the following: Computer Science, Maths, Architectural Technology, Human Biology, Biology, Building Construction, Chemistry, Engineering Science, Environmental Science, Geography, Physics or ICT. Graphic Communication is NOT a Technical Subject. Don’t have the grades listed above? Participated in an aspiration-raising programme such as LIFT OFF, LEAPS, FOCUS West, or Aspire North. No family background of going to university. Attended a school or lived in an area where not many people go to university. The worldwide shortage of cybersecurity specialists means that our graduates have little difficulty finding employment, with many Ethical Hacking students headhunted before graduation. Our graduates work for Dell Secure Works, Goldman-Sachs, GCHQ, NCC Group, Firstbase Techies, Nettitude, Portcullis, MWR, NCR, Prudential and many other prominent organisations. A lot of our graduates become security testers, but some prefer working in defensive roles in areas such as network management and software development. Others set up their own ethical hacking consultancy businesses. In 2005, Colin developed the idea for the BSc (Hons) in Ethical Hacking at Abertay. As the programme leader, Colin manages the day-to-day running of the programme and is there to help you if you have any issues while studying at Abertay. Watch Colin demonstrate a ransomware attack. An introduction to computer networks through an analysis of basic networking fundamentals. Module content includes: networking fundamentals – architecture, effects of media on bandwidth and data throughput, review of hubs, switches and routers and their advantages/disadvantages in a network configuration; network layers – data segmentation and encapsulation, use of MAC and IP addresses by network switches and routers, TCP and UDP protocols, class based networks, allocation of IP address and their identification, need for and determination of subnets and subnet masks; network models, protocols and applications. Provides an understanding of the issues and practicalities involved in securing computer systems and the framework within which the computer security specialist/ethical hacker/digital forensic investigator would need to operate. Provides a critical understanding of the tools used by ethical hackers to examine the security of a device or network. Students will systematically investigate a computer network for possible vulnerabilities. An examination of the basic technology and techniques used to investigate cybercrime. Students are provided with the ability to carry out computer forensic investigations and appraise forensic software with a view to develop appropriate investigation strategies in the light of emerging digital technologies. An introduction to the ideas and concepts of how computers, mobile devices and gadgets communicate with each other and other devices such as Ethernet, VLANS, STP, Wireless, Routing, Subnetting, IPv6, SNMP, DCHP, DNS, Firewalls and Network Management. Develops a critical understanding of the advanced techniques used by ethical hackers to examine the security of web applications and mobile devices. Provides an understanding of the broad area of binary auditing. Students will also gain an understanding about the countermeasures that a company can take to minimise the effect of vulnerabilities. An understanding of software development practices for applications for a range of smart and mainly mobile devices. Module content includes: background to smart and mobile development; user interfaces; storage; using the network location capabilities of mobile devices to develop feature rich applications; telephony SMS; communication networks; security implications of mobile and smart platforms, how these can be exploited and development considerations to improve resilience; methods for testing the functionality and performance of applications on mobile devices; mobile web application development. An overview of the forensic investigation of computer (e.g. TCP/IP) and mobile phone networks. Provides an understanding of the underlying communications technologies and develops a comprehensive, systematic approach to the discovery and examination of evidence from both end-user devices, such as phones or tablets, and the networking infrastructure itself. An examination of the methodological framework for security testing via ethical hacking of computer systems and networks including countermeasures to flaws found by penetration testing. Module content includes: design of a vulnerability assessment and analysis test; rapid penetration testing; methodologies. How do hackers break into computer systems? Is it easy to breach a corporate network and steal secrets? What steps can organisations take to prevent attacks? These are just some of the questions the programme will answer. Abertay students learn how to take a practical and offensive approach to cyber security by deliberately breaking systems and circumventing security defences. Understand the process behind hacking attacks. Gain the technical knowledge to undertake security audit testing on computer networks and systems. Ultimately, our Ethical Hacking degree, which is accredited by BCS, the Chartered Institute for IT, provides you with a deep understanding of how illegal computer attacks can be performed and how they can be stopped. For more detailed module and course information, download the BSc (Hons) in Ethical Hacking programme flyer. You’ll learn through a blend of lectures, tutorials, practical work and reading. The majority of modules make use of online learning resources. Real world case studies of major attacks and data breaches are used provide the opportunity for critical analysis and evaluation in class. During practical exercises, you’ll be expected to evaluate your own work to make sure that products are functional and fit for purpose. Knowledge and skill are assessed through project work, reports, portfolios and practical assessments. Approximately 20% of the programme is assessed by examination. As an Abertay Ethical Hacking student, you’ll have the opportunity to participate in Securi-Tay. The largest information security conference in Scotland, Securi-Tay features talks and workshops from industry experts, giving you the chance to learn more about the latest industry developments and speak to recruiters from companies like Dell Secure Works, Goldman-Sachs, GCHQ, NCC Group, Firstbase Techies, Nettitude, Portcullis, MWR, NCR, Prudential. Securi-Tay is run by Abertay’s Ethical Hacking Society. As an Ethical Hacking student, you’ll have full access to Abertay’s custom-built Hack Lab. Every PC in the Hack Lab is isolated from the main university network, allowing you to experiment with all aspects of ethical hacking in a safe, controlled environment. You’ll be aggressively exploiting flaws in realistic websites and networks, so removing the ability to cripple the university network is crucial! Meet some of our Ethical Hacking graduates and find out what they've gone on to do. Getting a helicopter to work - discover what life offshore is like for a Consulting Analyst in a cyber role. Ciaran travels all over the world as a Technical Consultant at Appirio. Typical offer: 32-34 points overall from the full IB Diploma. We accept a wide range of qualifications from applicants from over the world. Select your country from the below options. Sorry, we are still working on the entry requirements for . Please send an email to Beth Meehan who supports students from country in successfully applying to Abertay University at b.meehan@abertay.ac.uk and he will be happy to help you with obtaining this information.